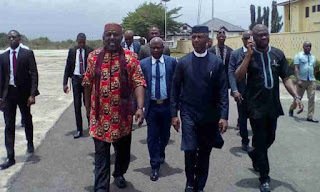 Governor Rochas Okorocha of Imo State has disclosed that his former Chief of Staff, Uche Nwosu, who is also a governorship aspirant, might quit the APC to realize his ambitions. Speaking to newsmen on Tuesday, the governor stated that he does not intend leaving the ruling party. He stressed that Nwosu and all the aggrieved candidates remained his choices and will get his support under any platform they chose to join. 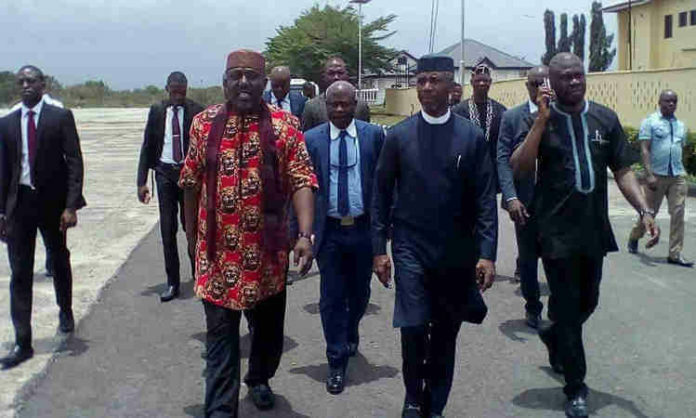 Okorocha said: “What will happen is that while they move to realise their ambition under any other platform, I remain in APC and support them. Such party will have no presidential candidate but will adopt President Muhammadu Buhari as their candidate. “What we saw in Imo APC was a clear case of injustice and the worst imposition in history. The party members are aggrieved and they will be moving to another party to pursue their ambitions and I am not going to stop them, but we are going to form an alliance with whichever party they choose to deliver President Buhari. “In the 2019 general election, we are going to vote for candidates and not political parties. I am in the best position to assess the candidates and I know that among all the governorship candidates, Nwosu remains the best. I have told Imo people to check the records of those clamoring to govern the state before voting for them.